Humans had dreamed of soaring like birds for centuries, but only since 1903 has science made it possible. In 1917 -- just fourteen years after the Wright Brothers made their first historic powered flight -- the United States decided to establish the first civilian laboratory dedicated to unlocking the mysteries of flight. It was on the banks of the Chesapeake Bay in Hampton, Va.
"Just prior to the first world war, Jerome Hunsaker was sent by President Wilson to look at aeronautics in Europe," said Ed Kilgore, a NASA employee from 1944-1982. "We had about 30 airplanes at that time. Russia, England, Germany had over 1,000. Hunsaker came back telling this sad story. On that basis Wilson signed an order that we should form an aeronautical laboratory within an overnight boat or train ride from Washington, D.C. Langley Field fit that criteria." For most of the first half of its 90 years in existence the Langley Aeronautical Laboratory concentrated on aviation. "No place has played a larger role in the history of American flight technology or flight technology in general than Langley Research Center," commented Tom Crouch, noted aviation historian at the Smithsonian Institution. "It's hard to think of an airliner in the air today that doesn't have Langley's signature on it. It's hard to think of a military airplane flying today that Langley wasn't involved with in one way or another." Langley research established many of the basic building blocks of aeronautics, changed the shape of aircraft and helped allow jets to fly at supersonic speeds. Then came 1958 and the dawn of the space race. The National Advisory Committee for Aeronautics, which had established Langley, became NASA, the National Aeronautics and Space Administration. The newly named Langley Research Center added space exploration to its repertoire. Langley started Project Mercury and the Space Task Group, which oversaw the burgeoning U.S. space program, and the original seven astronauts. "They were on campus every day. Every day you saw them on the flight line. You saw them in the grocery store," said Ray Hook, a NASA employee from 1958-1994. " They were exciting guys. They were highly selected for their mental and physical capabilities." Even after the Space Task Group moved to Houston Langley continued to use its decades of scientific know-how to help send Americans into space and eventually to the moon. "What Langley gave to this group was a bunch of people who were expert in what they did and way ahead of their time," said Kilgore who helped pull together space activities at Langley. Simulators designed and operated at Langley helped astronauts learn how to rendezvous and dock in space and land on the moon. Neil Armstrong, the first man to walk on the moon, was one of the dozens of astronauts who trained at Langley. When the U.S. decided to develop a reusable spacecraft NASA turned once again to Langley. Researchers in Hampton put space shuttle designs through thousands of hours of wind tunnel testing. 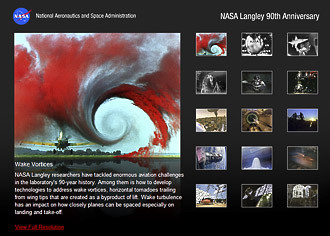 To this day NASA Langley researchers carry on the legacy of their pioneering predecessors. Whether its testing airbags for space capsule landings, developing technologies to allow aircraft to fly at supersonic and hypersonic speeds or studying Earth's atmosphere to better understand global climate change … NASA Langley remains on the leading edge as it has since 1917. The NASA Cultural Resources channel is a repository of videos, mostly test films that have been scanned to digital format. The channel is part of our Cultural Resource Management (CRM) of archaeological and architectural resources of historic significance. NASA's CRM Program includes public outreach and education to highlight NASA's historically significant contributions to science, aeronautics, technology and space exploration. Every NASA center has contributed in some way to the advancement of aeronautics and space exploration. Historically documenting their contributions is extremely important as it is a continuous process and almost endless flow of information.